Kent Sport invites spectators to enjoy this year's Mike Wilkins Charity Trophy at 17:30, 29 May 2013 at Kent Sport's 3G pitch at the Pavilion. 2013's match will be the seventh installment of this annual event and sees the elite of university football (Kent F.C’s 1st XI) pitted against the best players from the campus-based Inter College Football League in a one-off exhibition game. The 2013 team captains are Alex Ramsay (College Elect, Eliot F.C.) and Stefan Wolf (Kent F.C. ); the referee will be Elliott Hollobone. This charity-driven exhibition game aims to highlight the outstanding contribution former Director of Sport Mike Wilkins made to sport, and in particular football during his 36 year tenure at the University of Kent. Mike coached the Men's 1st XI for a number of years leading them to three national finals during the 70's and 80's, against Sheffield and Loughborough respectively. He was also responsible for the development of the Inter College Football league and secured the 3G artificial surface which is used by staff and students at Kent on a daily basis. The gate fee is £2.50 and contributions will be in support of this year's charity, The British Heart Foundation. 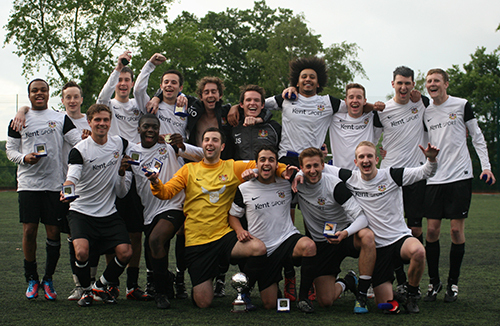 Mike Wilkins Charity Trophy 2012 winners – Kent F.C.